With news on the Apple iPhone 8’s swelling battery issue spreading in recent weeks, battery makers purported to have business relations with the tech giant are facing a dilemma. Due to customary nondisclosure agreements, the battery makers have been remaining mum on news reports speculating on which manufacturer is responsible for the problem. Currently, firms from Korea, China and Japan are known to supply batteries for Apple’s iPhone 8. 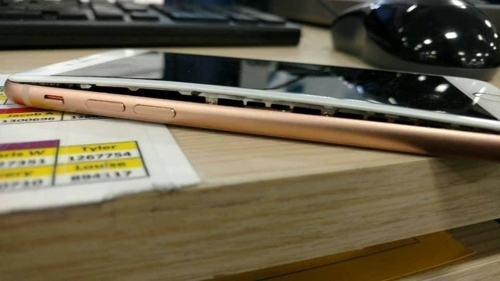 The problem was first reported on Sept. 24 by a Japanese user, who tweeted pictures of his device that showed bowing in the screen and how it separated from the main chassis. More reports have emerged from other nations including the US, China and Canada. The media has shifted its attention to the source of the batteries, as the case resembles the explosion issue involving Samsung Electronics’ Galaxy Note 7 last year. Samsung SDI and China’s ATL had provided those batteries. This week, state-run Chinese media reported that a South Korean firm, Samsung SDI, may be behind the iPhone 8’s problem. The company declined to comment on the report, but an industry source familiar with the matter told The Korea Herald that Samsung SDI is not involved in the issue, though no details were provided to support the claim. Following the Galaxy Note 7 fiasco, Samsung SDI has taken full-fledged measures to secure battery safety, investing around 150 billion won ($132 million).